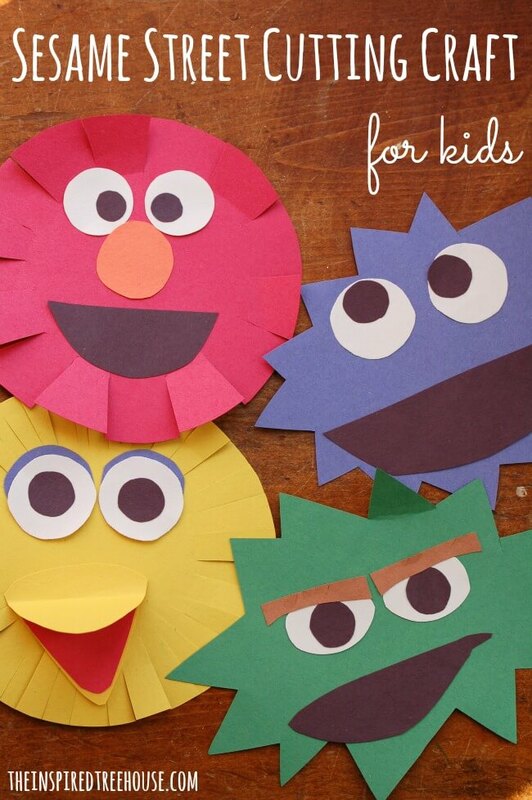 Check out this super easy (and super adorable) Sesame Street cutting craft for kids! When I was a kid, if you said you were “watching tv”, you meant you were watching Sesame Street. It was the kids show of our generation and continues to be one of the most iconic brands in the television and education industries. And with good reason. Sesame Street takes an active approach to learning that uses creativity, music, and movement to get kids engaged. And we all know that active bodies and imaginations mean active minds! On January 16th, Sesame Street will be joining forces with another iconic brand, HBO, bringing viewers a fresh new way to watch the show! 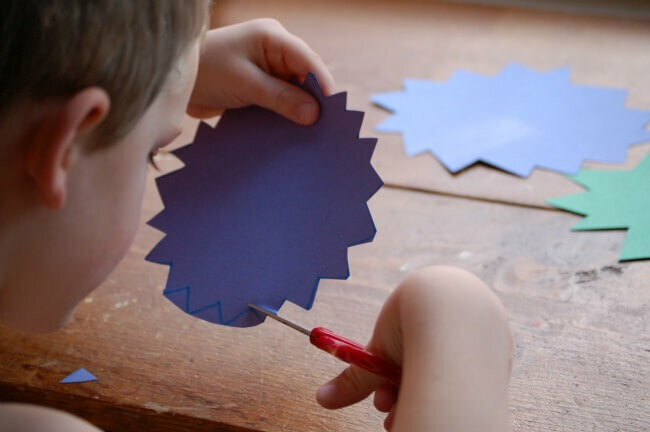 To celebrate Sesame Street’s new partnership with HBO, we thought we’d whip up a super fun and easy craft for kids that will help with those all-important scissor skills! This one is perfect for kids of all ages and ability levels – from little ones who are just getting the hang of snipping to slightly older kids who are learning to cut on lines and cut out shapes. For younger kids (or kids who are just learning to snip with scissors), simply have them snip around the edges of each shape to make the character’s “fur”. 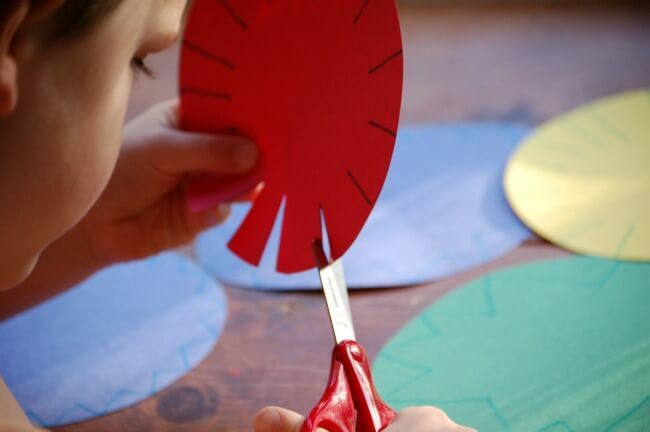 For kids who are learning to cut on lines, draw short lines around the edge of each shape and have them follow the lines with their scissors to make the “fur”. 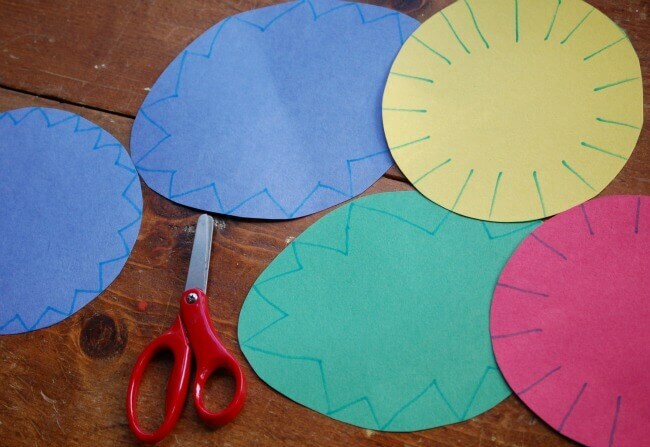 For kids who have more advanced scissor skills and are learning to change directions and turn their paper to cut out shapes, draw zig zag lines around each shape to make the “fur”. While the kids are cutting fur, start cutting out the other facial features (eyes, noses, mouths, eyebrows) for the characters. Then, work together to put the features where they belong on each of the faces. And voila! You have some adorable Sesame Street characters perfect for decorating your classroom or refrigerator! These would be the perfect preschool classroom craft and would also be a fun make-and-take for a Sesame Street themed birthday party! Beginning on January 16th, Sesame Street will be airing new episodes on HBO, HBO NOW, and HBO GO! All of your favorite Sesame Street characters in a brand new viewing space! 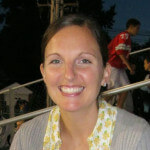 Be sure to check out HBOkids.com and sesamestreet.org for more details. ENTER TO WIN A $100 VISA GIFT CARD! Simply leave a comment below telling us about your favorite episode or segment on Sesame Street from when you were a kid or your child’s favorite episode or segment. Each comment will be automatically entered to win! We can’t wait to hear from you! I loved it when Bert and Ernie would play in the bathtub with their toys and bubbles were going everywhere! I also loved it when Kermit sang It Ain’t EAsy Being Green. I always enjoyed Cookie Monster eating all of the cookies and the other characters trying to convince him to share. The kids love The Spy who Loved Cookies, My favorite Sesame Street character when I was growing up was Big Bird still love him. My favorite episode was the one they explain where our loved ones go when they pass away. And the emotion we go through. I’m just so touch by that and find comforts as well. I can’t remember my exact favorite…. But basically whenever Cookie Monster was on! You should see how my girlie girl gets when Elmo comes on screen! she gets so excited! My parents bought Sesame Street books that used to come in the mail every week. I remember feeling so excited when a new book arrived. I now read those books to my children. i LIKED WATCHING bIG bIRD. I especially enjoyed the special about Big Bird in China. I loved the “ladybug picnic” song when I was little. I always like the part where Big Bird’s friend Snuffleupagus showed up. I like any episode that focuses on family values and treating each other well. I can’t come up with a specific example of an episode. I love the episode that talked about loving your hair. my son loves all of them. he loves when they dance and sing! I loved the Sesame Street song/video We All Sing the Same song. I sang it as a kid all the time. I still find myself humming the tune every now and again. I can’t remember a specific episode, but they especially liked the ones featuring Oscar the Grouch! My favorite segment was anything with Bert and Earnie as a kid. I remember watching the Cookie Monster eat so many cookies. I liked watching Elmo laugh. I can’t remember a particular segment, but I always loved those Martians that said yip, yip. Only my youngest children were in the right age group to watch Sesame Street. The others were much older. Considering that my children watch when it first began in the 60’s I don’t remember what they enjoyed most. They all enjoyed Cookie Monster though. My favorite memory is watching the show with my Mother as a child and always listening to the theme tune knowing it meant time to collect my Sister from school. Big Bird was always my favorite Sesame Street character when i was growing up – i can’t recall a particular episode as its been too many years! I can’t think of one episode in particular, but I’ve always loved Big Bird. I loved the music in Sesame Street when I was a kid. My nieces really loved those mid 90’s episodes of Sesame Street with Big Bird. Gosh. I haven’t watched this show since I was a kid and I am 42! hahaha I don’t remember segment names but always loved it when they visited Burt and Ernie’s apartment. Wow that was a long time for me and I remember one about counting and that is it! When Ernie sings the Rubber Ducky song. It’s been so long since I’ve seen Sesame Street I can’t remember, but I always remember Sesame Street Live and meeting big bird. Love your craft, we are definitely going to do it this month! :-) We like the episode with Cookie is a Sometimes Food (with Cookie Monster of course), and newer episode Grover Does It All– 2 favorite characters that make you smile and laugh!!! I loved the little boy Jonathan. He was so cute and curious and wonderful. Watching his clip still makes my happy. 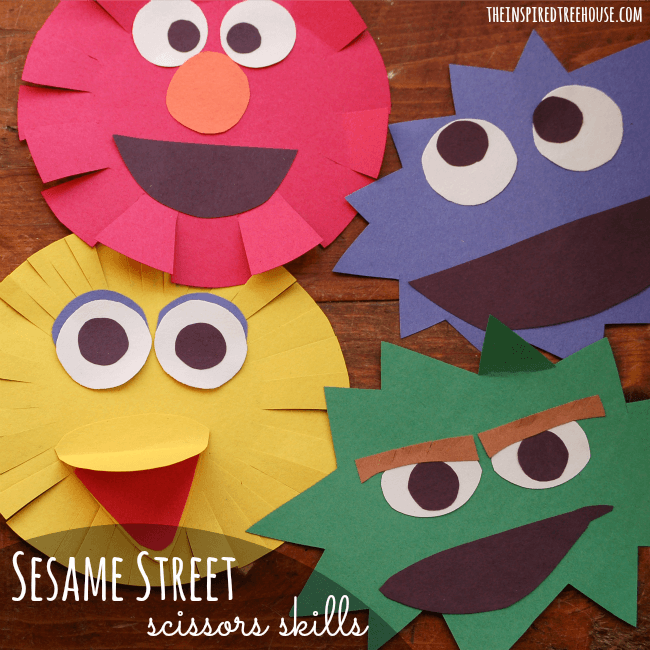 As a school OT, I can’t wait to introduce the Sesame Street characters into our practice with scissors! Love the direction they are going in the recent couple years. Big fan!